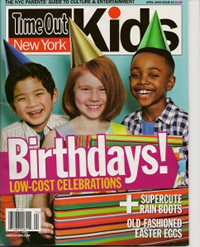 for NYC kids’ birthday parties & events! 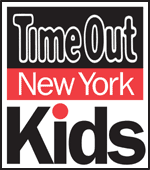 Featured as “Favorite” Face Painter in NYC Manhattan by Time Out Kids 5 years in a row! 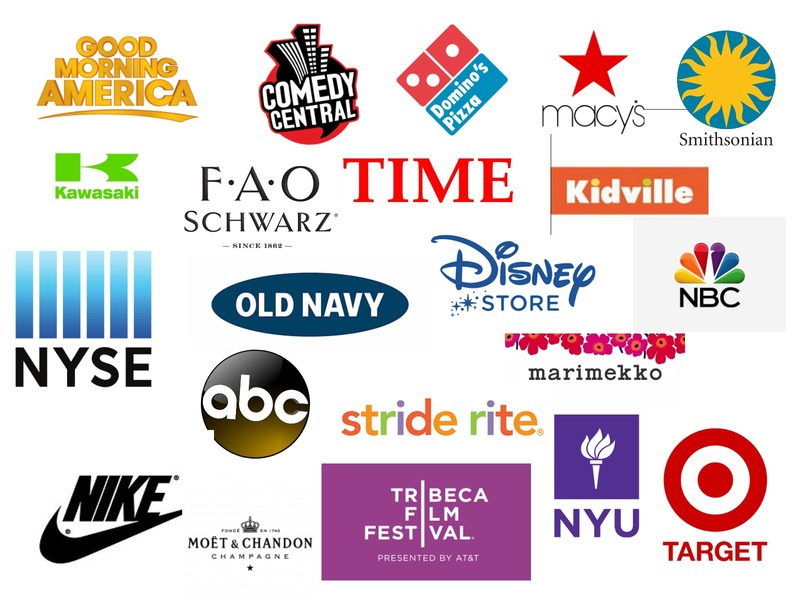 Some of our awesome corporate facepainting clients NYC! Childrens party entertainment & face painting & balloons – the perfect way to make your kids birthday party extra-special! 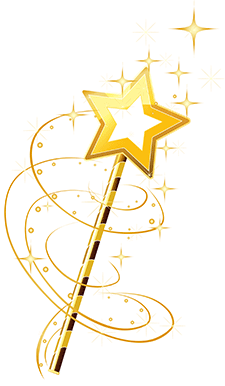 Once upon a time…..Kiki’s Faces & Balloons, a magical company of children’s entertainers, loved to brighten up kids birthday parties and corporate events in NYC with beautiful, high-quality face painting and kids entertainment. Face painting & balloon art are popular for all ages – super-fun entertainment for kids birthday parties or events. 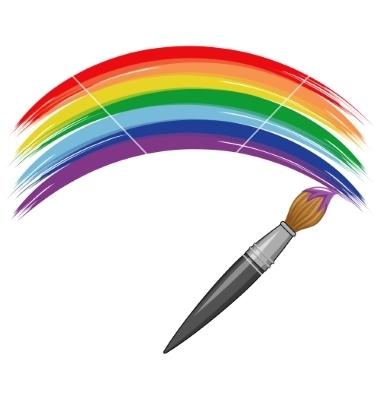 *Our “best-of-the-best” professional face painters are personally selected by Kiki (Artistic Director/Founder) and can do all popular kids face painting designs for girls & boys plus custom designs. *Our NYC face painting has been featured on the TODAY Show, Good Morning America, The NY Post. Check out our wide array of face painter party packages. *Our magical face painters can create ANY FACEPAINTING IDEA that a boy or girl can dream up! *Balloons are a super-fun addition to face painting for NYC Manhattan birthday parties or corporate events. You can hire one dedicated balloon artist, or one multi-talented “face painting balloonist” entertainer (our signature package). 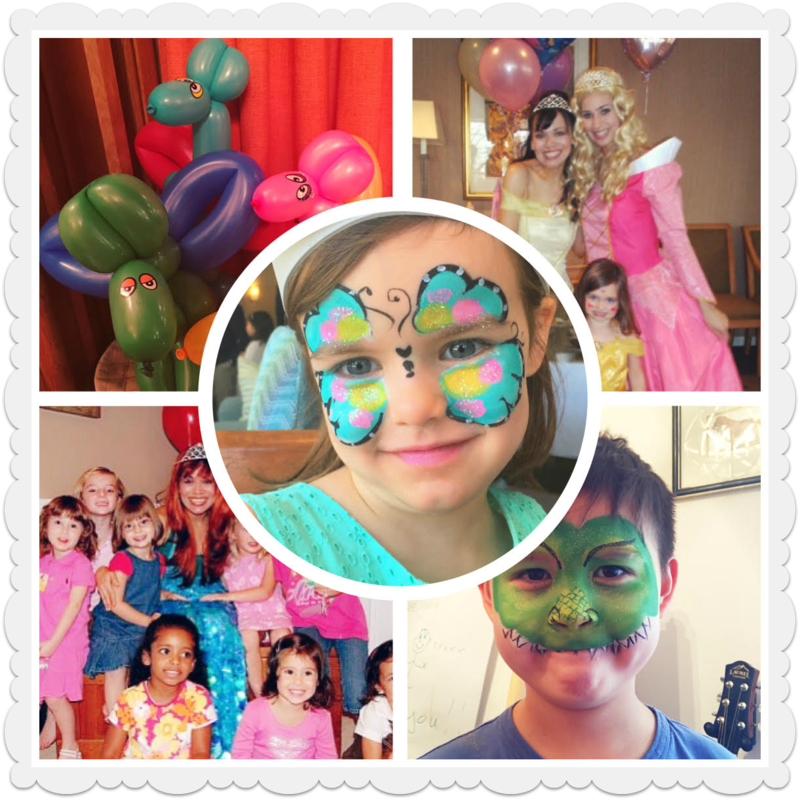 *Girls and boys LOVE our Princess Face Painters and Princess Balloon Artists – one of our specialties! Expertly cast from our annual “princess performer auditions” in Manhattan, our Princess Face Painters and Character Face Painters are adorable, sweet and talented, have gorgeous costumes and are excellent face painters and balloon artists. 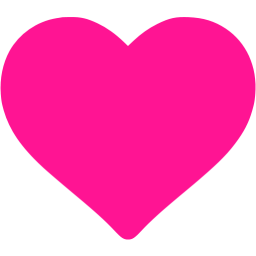 *At your NYC princess birthday party the entertainer will stay charmingly in their Princess character for the entire event as they create beautiful sparkly face painting designs or balloon art for the kids. 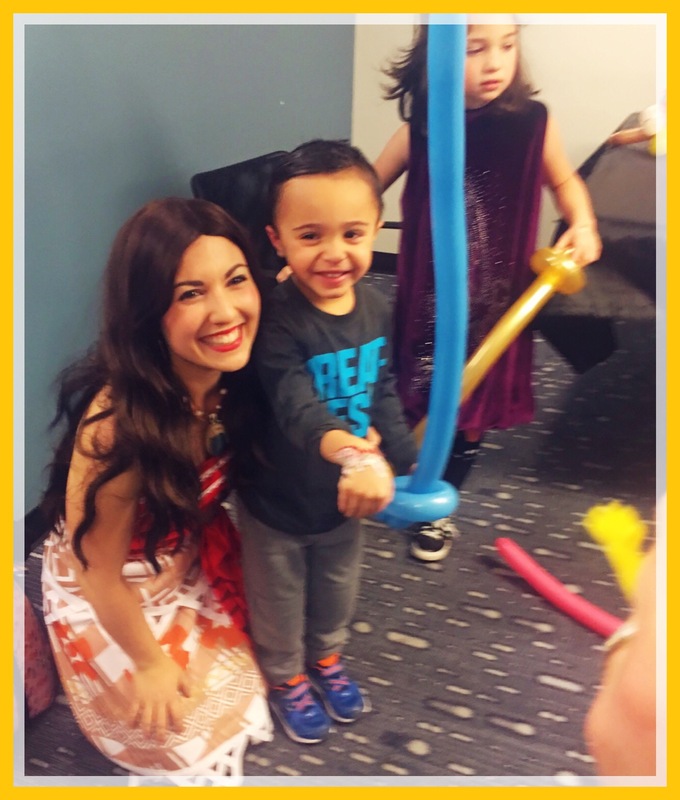 *All of our Princess character performers are super-talented Broadway-caliber princess entertainers that have teaching experience and love kids! Check out our Princess Party Packages page! *For the most magical and extra-special kids princess birthday party, we recommend our Princess Variety Package Character Variety Package! Featuring one or more charming birthday party princesses or characters, the Princess Character does an adorable Mini Princess Interactive Show (very fun and our specialty! 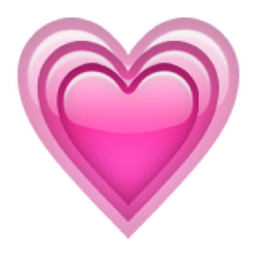 ), high-quality sparkly face painting or musical games or balloon art, too! *All of our princess performers are super-talented Manhattan-based Broadway-caliber princess entertainers chosen from an extensive NYC audition process. Most have lots of teaching experience, too! We love birthday party princesses – they are our specialty!Check out our Princess Party Packages page! Need more INFO or want to BOOK? Kiki’s Faces and Balloons is an award-winning Manhattan childrens party entertainment company specializing in beautiful, high-quality face/hand painting, balloon sculpting, face painter balloons, adorable “silly people”, clowns, and pretty princesses and princess character face painters for NYC kids’ birthday parties and corporate events. We serve Upper West Side, Tribeca, Upper East Side, Chelsea, Gramercy, Midtown West, Midtown East, Soho, Village, Financial District, Battery Park City, Upper Manhattan, and all other Manhattan areas. 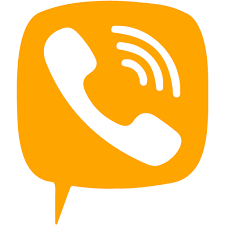 We also serve LIC, Williamsburg, DUMBO, Greenpoint, and other nearby areas. We do birthday parties, graduations, christenings, World Cup events, family reunions, school events, church events, synagogue events, community block Artie’s, Halloween events, Winter events, holiday events, Christmas parties, Fourth of July, Back-to-School, and more! Many of our entertainers and party princesses are Broadway and/or Disney singer-dancers, professional artists, or certified teachers. Each and every entertainer is super-talented, warm and friendly, and great with kids! For more info, or to reserve us for your next party, CONTACT US TODAY!